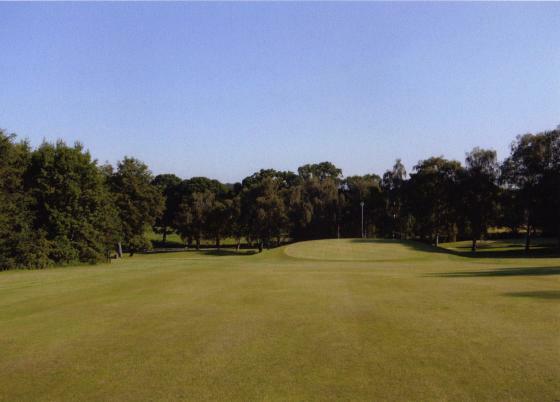 Sherard Winterton, Club Secretary, and Stav Woodings, Head Greenkeeper, accompanied us on a walk around the course but as it covers 154 acres more visits will be needed. 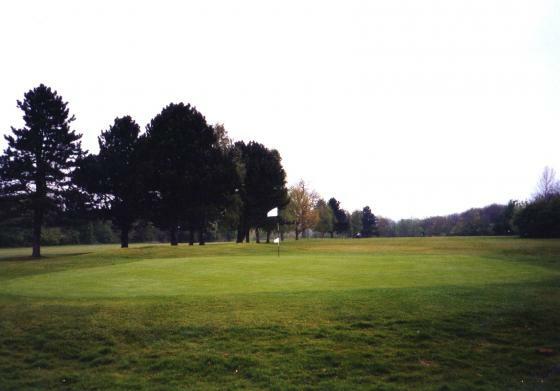 The Golf Club was founded in 1911 and from the clubhouse you can clearly see Ridge and Furrow. 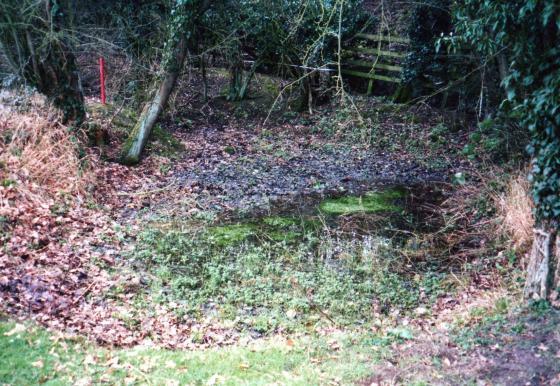 There is a good pond that was dug out in 1995 and this is recorded as Pond 3 in the Rothley Parish survey. 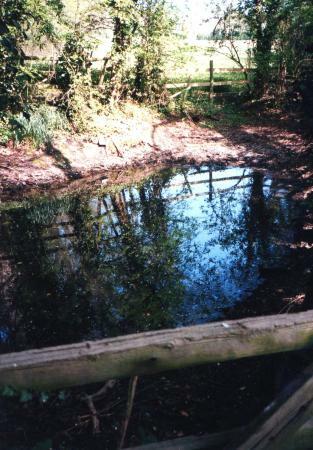 Prior to that the area was boggy ground with willows that were in a bad state and it was decided to make it into a pond feature. 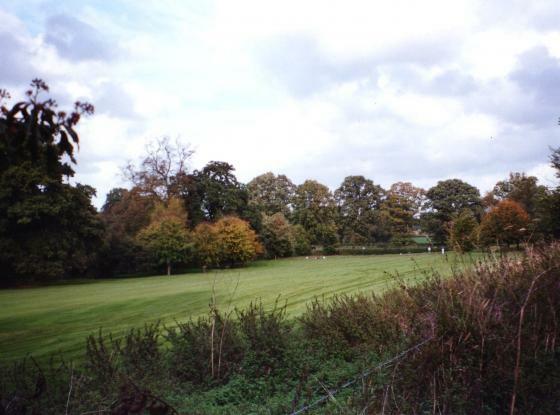 In 1999 I wrote to Rothley Parish Council on the local progress of the Field Ponds Action Plan, part of the Leicestershire, Leicester and Rutland Biodiversity Action Plan. In this plan, every parish was asked to provide details of a proposed pond to fulfill their obligations. 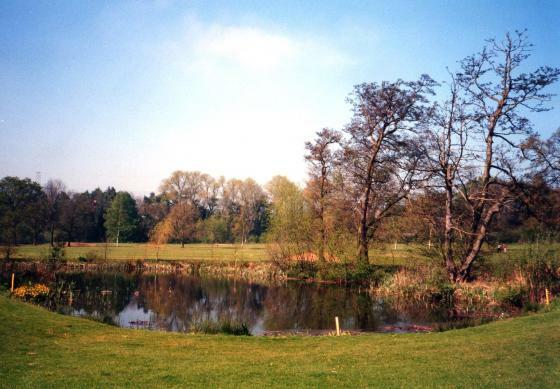 In the response from the council I was advised of the building of a new pond on the Rothley Park Golf Course which they hoped that I would accept as suitable in view of the wildlife it would attract. 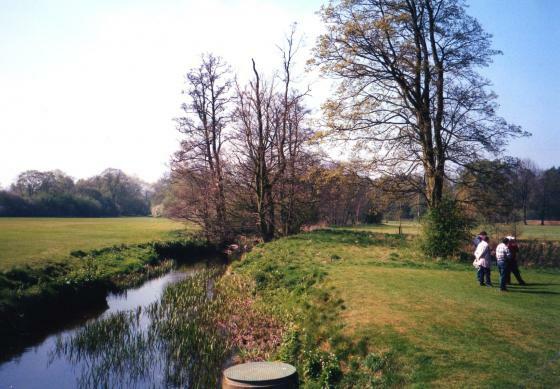 I am very pleased to say that having seen the pond it is an asset to Rothley and I know that it will be looked after. I was advised that John Strong of the Boot Aquaria manages the pond and ensures that it remains in a healthy state for wildlife. No introductions are made into the pond, wildlife just arrives. An area has been made using branches as a basking area for snakes which have been observed in the pond side vegetation. Frogs are abundant but the status of newts unknown. 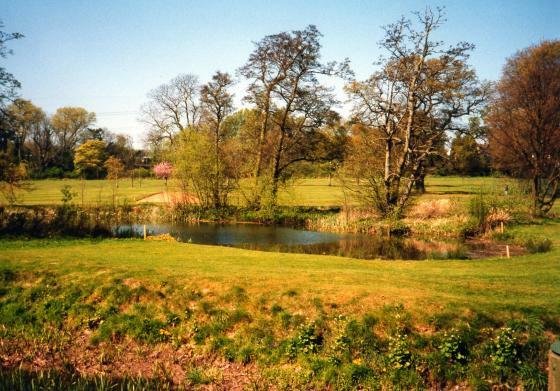 When the pond was constructed it was dug to a depth of 4 metres in the middle with shelves at 3, 2 and 1 metre and 30 centimetres for marginal plants and wildlife. It is 22 metres wide and 50 metres long. The base is clay. There are inflows and outflows, the outflow into Rothley Brook nearby. 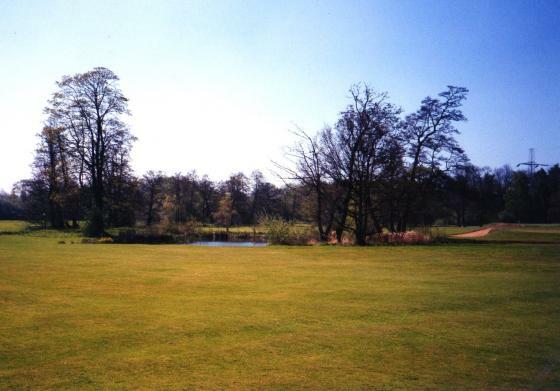 The trees around the margin give shade to 5% of the pond area. There are tall marginal plants at the perimeter with moss, emergent plants, floating plants, submerged plants and duckweed. The pond does not dry up, it does not smell, it is not fished and it looks very good. I was advised that it is very good for dragonflies. 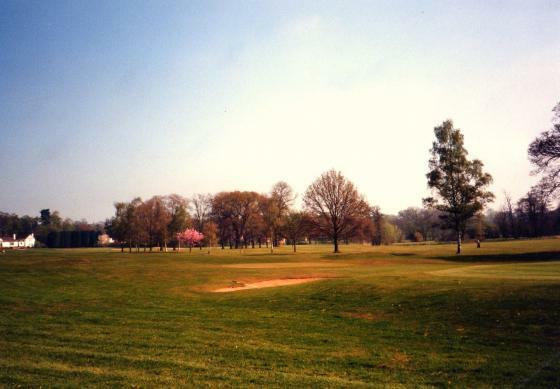 As you would expect for a golf course there are many lovely trees which will become Ancient Trees in the years to come. 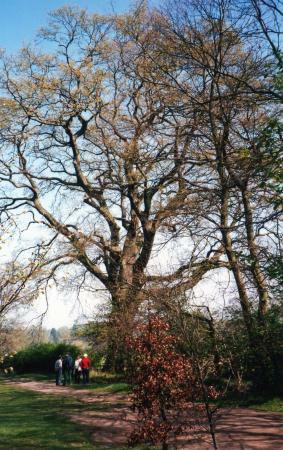 Ash Tree 52 has a girth of 3.4metres and is 18m high. It has a full canopy, no supported branches, standing upright with hollows suitable for birds and wildlife as well as wounds and dead boughs. It is sited in a hedgerow at SK57021, just below the car park. 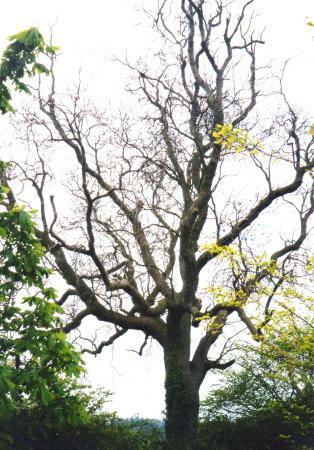 Oak Tree 53 has a girth of 4.3metres, a full canopy and no supported branches. Standing upright with dead boughs and wounds. This is another lovely Ancient Tree situated on the Practice Ground at SK571121. On the railway embankment there are active Badger Setts (2002) but the animals are kept away from the greens by scattering human hair, obtained from the local hairdresser, around the perimeter of the greens. As badgers are wary of the smell of humans the hair alerts them and they move away. There is an interesting small pond, Pond 4 in this Parish Survey, situated at the foot of the railway embankment where you can clearly see the stone construction on the far side. There appears to be no life in this pond, trees surround it with their debris falling in to create an unsuitable habitat for plants and amphibians. It does not dry up in the summer months. 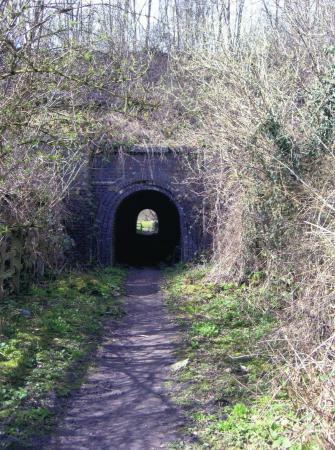 It has a fence around it and could have been used for the railway. We noticed very large granite boulders to the side of the course, near a plantation, and it seems that they were used in the 1939-1945 war by placing them on the fairways so that the golf course could not be used to land enemy aircraft. 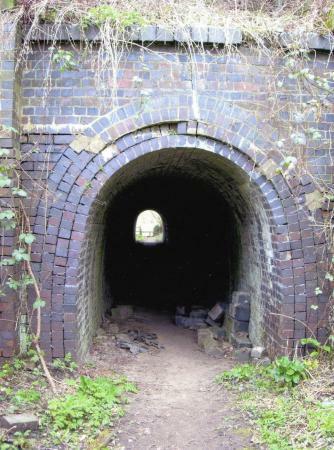 They had been supplied by the Mountsorrel Quarry. The Millennium Map was kindly loaned to us so that Brian Verity, the Archaeological Warden for Rothley, could go over it with a magnifying glass to check for ground evidence of buildings relating to the Romans in Rothley. The map had been produced by Wildgoose Graphics, now Get Mapping, but a copy would cost me £100 plus extras so I will have to be content with a small picture. Today we looked at a different part of the course in the area of fairways 6, 7, 8 and 9. 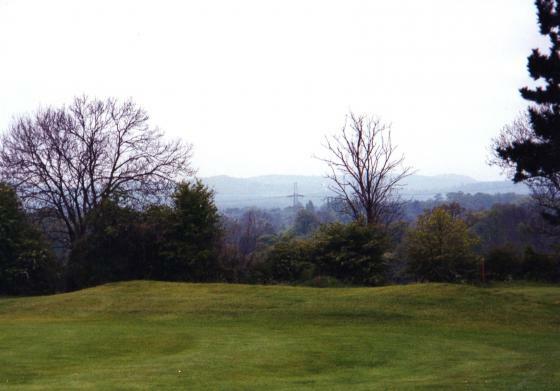 There is a lovely view to Bradgate Park from the end of fairways 8 and 9. 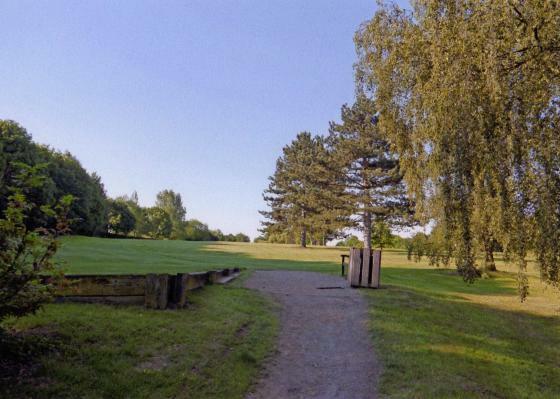 There are more lovely Ancient Trees in this area including a Lime Tree 55 on fairway 6 with a girth of 3.7metres with its branches sweeping down to the ground. There was a lot of twiggy growth at at 14m and a lot around the base which is typical of limes. It was in excellent condition and the biggest Lime found so far. Next to it is an Oak Tree 54 with a girth of 3.7metres making another lovely specimen tree on fairway 6. Moving over to fairway 8 there is an Ancient Ash Tree 56 with a girth of 3metres. It is set in a hedgerow and fungi was evident. The old hedgerow boundary trees in Rothley were mostly Ash and many have fallen and rotted over the years so it is good to still find some even if they are not in good condition. There are plantations of young trees around this part of the course so let us hope that they survive as long as their predecessors. There are some good, old hedgerows around this part of the course and it was pleasing to see a good amount of Elm. It can stay healthy as part of a hedge that is cut and maintained. 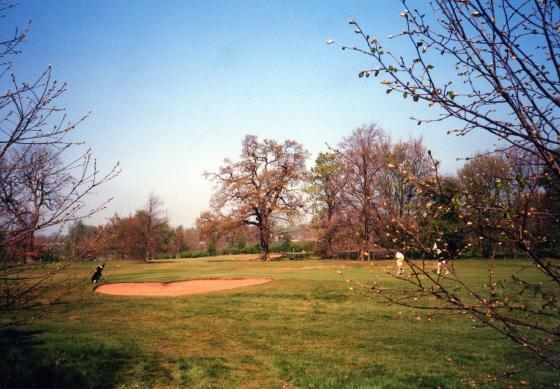 Not far from this part of the course there was a lovely Avenue of Elms on the land that was part of Brookfield Farm which had to be cut down in the early 1960's due to Dutch Elm Disease. Also, as part of the hedgerows and boundaries there are some good, strong young trees such as Horse Chestnuts that were flowering well. I could not see any evidence of Dogs Mercury, an ancient woodland indicator plant, but violets can be found. Plenty of umbellifers, Red Campion and Wild Arum but, being a golf course, there has to be management of most of the area and its appearance has to be one of tidiness. In the next-door beanfield there were two Lapwings displaying, a Chiffchaff and Green Woodpecker were also calling. A Kestrel had previously nested in an ash tree nearby. 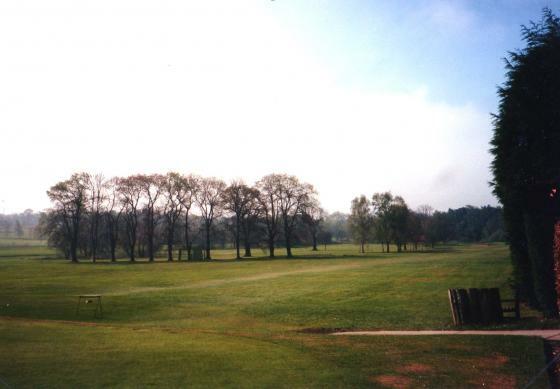 Rothley Park Golf Course, once being part of an ancient area of Rothley, has a lot of history within and part of its boundaries. Another project of the Rothley Heritage Trust is to record some of the Ancient Temple Boundaries as well as the whole of the Rothley Ancient Ecclesiastical Boundary. Many more visits were needed over the next few years and there is still work to be done in 2012. 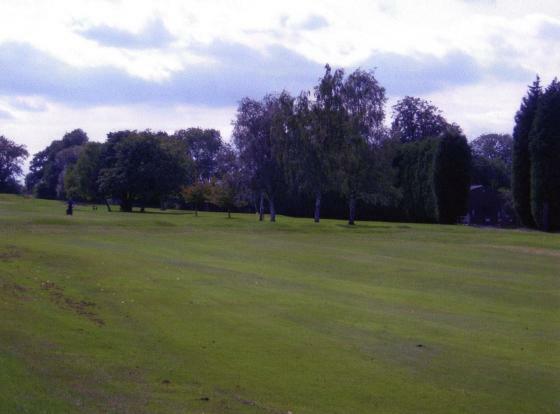 Location: Rothley Park Golf Club, Fairway 15/ Field adjoining. This morning we were met by Dave Holling who drove us to the starting point of Stint 12. 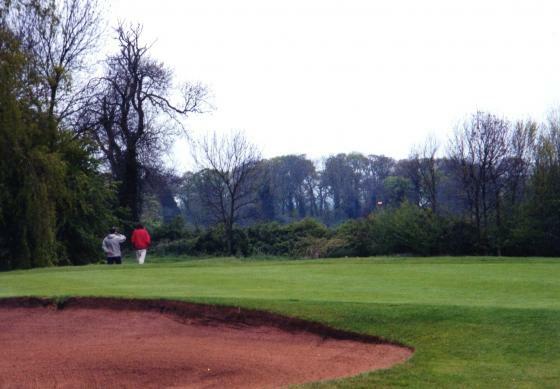 Martin Brown, Manager of the Greens, joined us a little later, it is really good that he is interested in what we are doing and he does have background information to the site. This stint begins with the Ash, Tree 233, on the edge of Fairway 15 and, at this point, the boundary runs along the field side of a spinney, not the Fairway side. 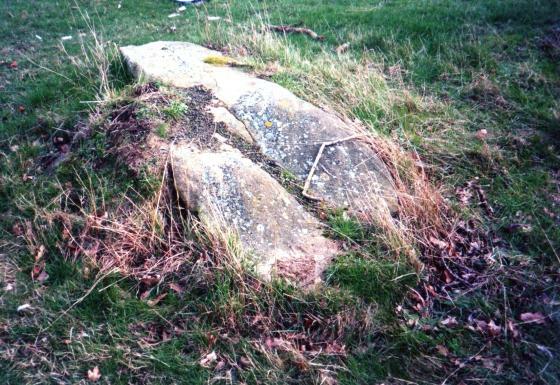 There is also a very large granite stone next to the Ash Tree. This part of the stint has a good ditch, which has broken down over the years as it has not been needed for drainage and therefore not maintained. The whole length of this stint has Bluebells growing on the far side of the ditch and they can easily spread as the back of this part of the boundary extends into the spinney planted by the Woodland Trust seven years ago. 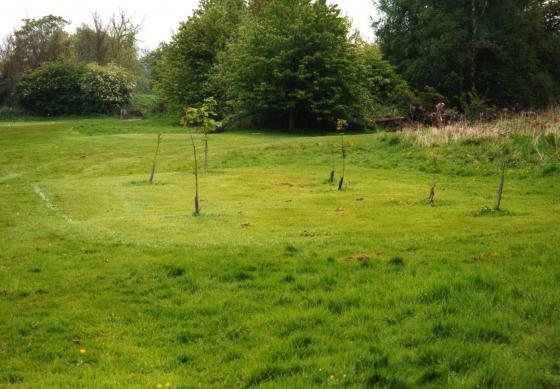 This spinney has not been maintained but, under the planting agreement, it will be taken over for management by the Golf Club in 2013 so I am sure that it will receive sympathetic attention after this time. 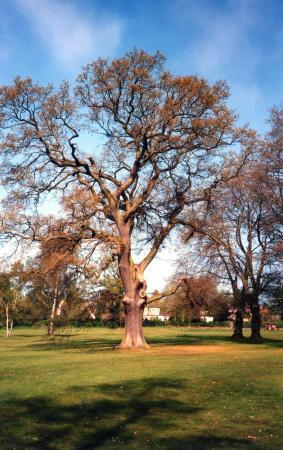 There are a further two boundary trees in this stint, both Ash, Trees 235 and 236, one of which qualifies as an Ancient Tree with a girth of 3.8 metres. 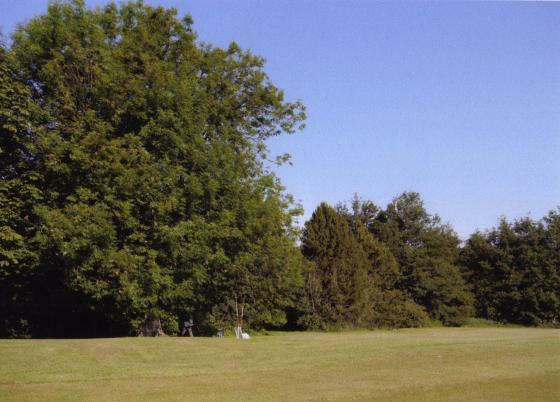 However, boundary trees are historically important and therefore they are detailed in the survey. This stint is interesting for the amount of Elm it contains. 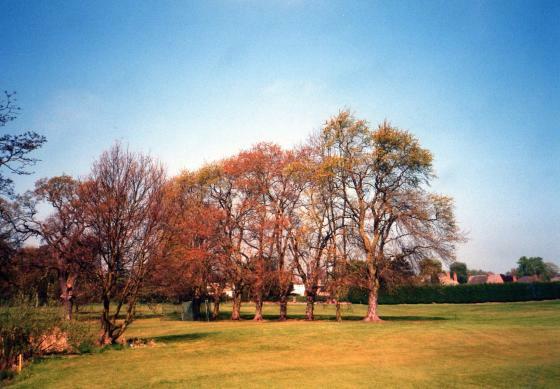 Huge numbers of Elms were lost in Rothley to Dutch Elm disease, especially in this part of the parish and here you can see young dead elm trees together with younger elms that are alive due to their size. This is typical of the life and death of young elms. There is only a small amount of hawthorn and the Oak trees have still to reach a size suitable for being called Boundary Trees. 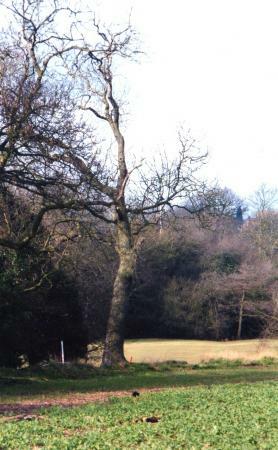 When the spinney is managed by the Golf Club this hedgerow should get more light and perhaps the elm could become more substantial if maintained at a height for survival. It was a cold day and a blizzard started to blow so that was the end of our morning's activity. Martin very kindly returned us to base where we arrived a bit wet but very pleased with this really interesting stint with more to come. 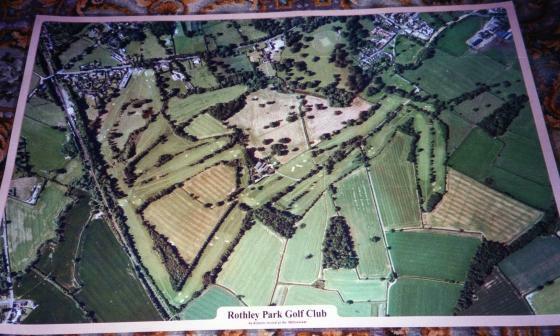 Owners: Rothley Park Gold Club/Field farmed by Anthony Cooper. A lovely morning with Spring in the air and the song of the Skylark overhead. The whole of this Stint is rather gappy and, as in Stint 12, it is backed by the Woodland Trust spinney. There are many species with old, thick trunks and twisted dead pieces on the ground. 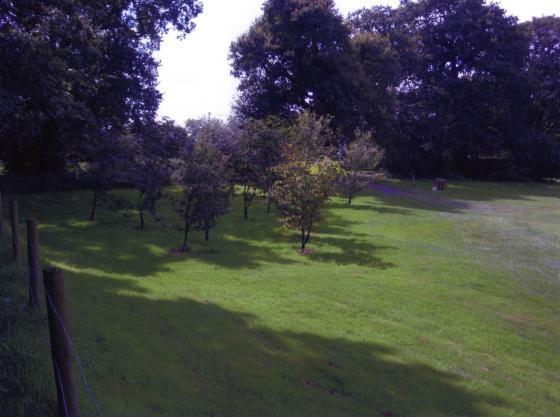 There are trees on both side of the continuing ditch and a lot of Elmre-growth. This is one of the best stints for species and in the first 30 metres we recorded Hawthorn, Elm, Elder, Blackthorn, Maple and Oak with Bluebells. The next 30 metres was just as good and ended with an Ancient Ash, Tree 238, in the Natural History Survey and the start of a series of very large boulders. The next 30 metres showed an interesting curve to the ditch, still with large boulders, and our first evidence of wild rose. It ended with an Ancient Ash, Tree 239, which has been recorded not because of its girth but as a Boundary Tree that is in rather a bad state. The final 30 metres did show some evidence of ditch clearance, as there was the start of a bank on the far side at the end of the stint. We recorded a lovely Ancient Oak, Tree 240, with a girth of 4.3metres at the end of the 120 metres but this was very war torn possibly by a lightening strike as evidenced by the exposure of heartwood from the base to the height of the main trunk. However, it is a good site for birds as there are good holes for nesting. This is the most interesting Stint so far due to the variety of species, the ditch, bluebells and large boulders. The age should average out at 500 years+. 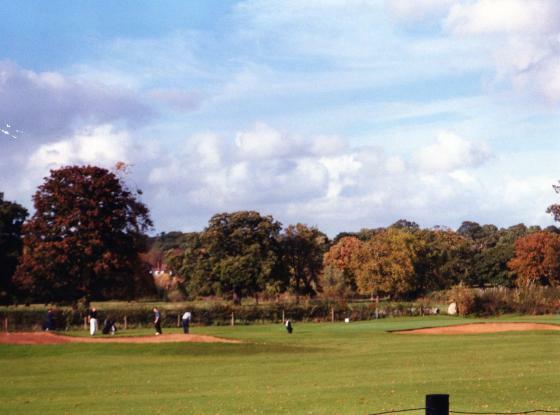 Owners: Rothley Park Golf Club/Field farmed by Anthony Cooper. 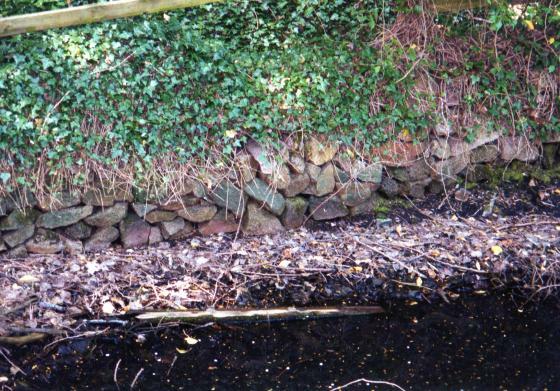 The first 20 metres of this Stint was a continuation of Stint 13 with the same features but much more evidence of ditch clearance in the past shown by the bank on the far side of the ditch. There were two very big boulders at the end of this portion of the Stint. 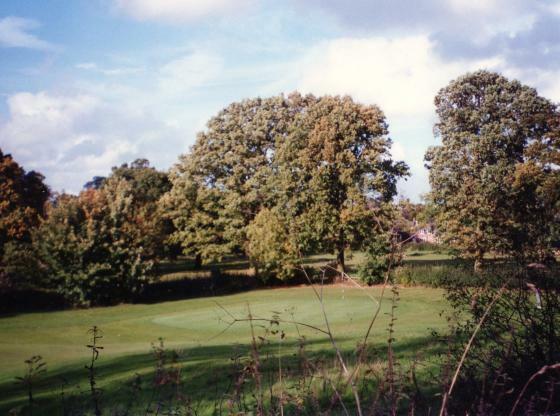 This part has gappy species with young ash and oak ending with a Horse Chestnut that is part of a line of field boundary trees alongside the field and fairway. The next 61 metres runs over Fairway 14 where there is a dip in the ground showing where the ditch continues. The final 39 metres runs through a small copse but still showing the ditch and full of young dead elms which appear to be marked for clearance. 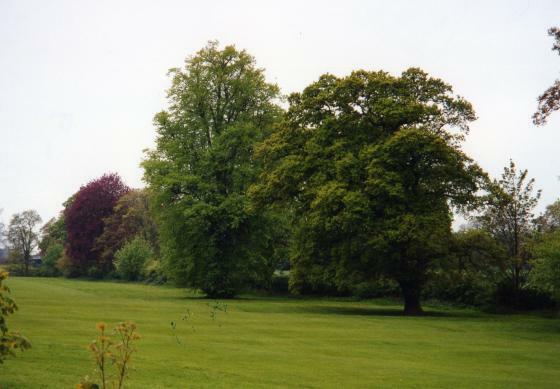 It is difficult to define the boundary species in this part as it is mainly suckering elm. The end of the Stint comes out just 2 metres into the field on the other side of the Bridle Road between Rothley and Thurcaston. This last 2 metres has a corner with a cluster of young, dead elms with suckering elms on the boundary line mixed with elder. 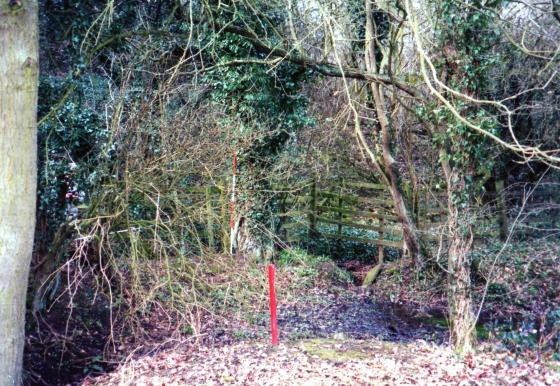 Terry informed us that there was a gate at the actual boundary point on the Bridle Road at the time of Enclosure. This Stint will not reflect a true age as in Stint 13 due to modern changes but is a very good example of how an Ancient Boundary can be lost in history. It would have looked just the same as Stint 13 with its ditch and hedgerow. 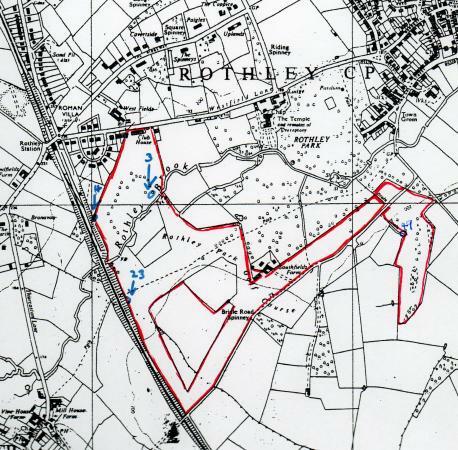 The land that is now Fairway14 was known as South Hornbuckle on the Rothley side of the boundary. Our next part continues as a 'real' boundary with hedgerow and trees right up to where the Parishes of Rothley, Thurcaston and Wanlip meet. 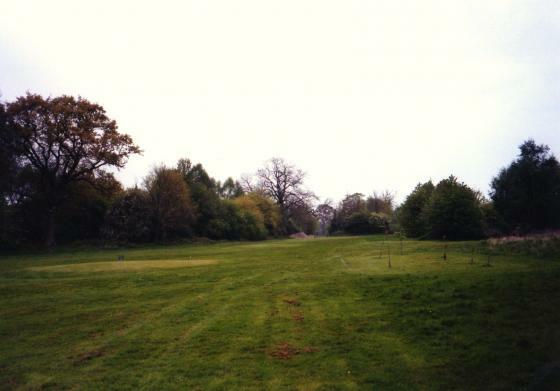 We continue over the golf course green along the site of the original boundary ditch which was filled in to create the golf course. The course of the ditch can be seen looking like an animal track and still with a slight dip. We are working along the old boundary between Thorney Wong and Pethefers Close. At the end of Stint 21b there is an Ancient Ash Tree 634 with a girth of 3.4m and from there we are looking forward to more ancient spinney that remains between the golf course and the adjoining arable field. We can see the ancient ditch and a pond site so exciting times ahead. We now have to wait until the late autumn before we can do more recording as the vegetation is too dense to get a good idea of the terrain. Due to the snow and ice that came so early we were not able to begin again until the start of the New Year. Stint 21c starts at the edge of the golf course just before the Ancient Ash Tree 634 and then into the thicket that hides the evidence of the ancient boundary. 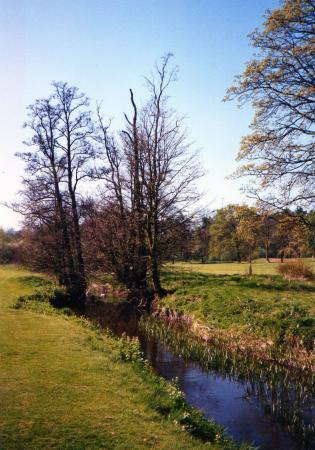 The ditch is in good condition, maintained by the club, and it runs into the remnants of a pond which needs to be traced on the old maps. 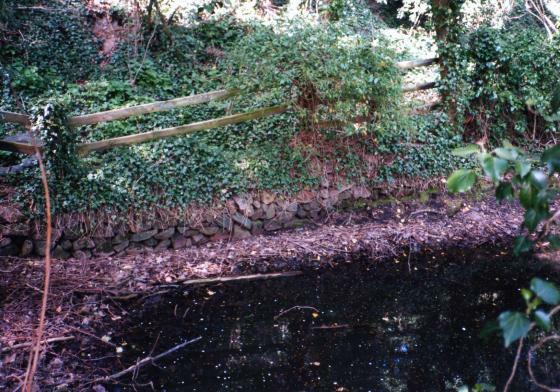 The pond would not support wildlife as it is shallow and full of leaves due to the surrounding vegetation. However, it is on the old maps so it has been recorded as Pond 49, Pethefers Pond. Walking in the ditch, which meanders in this part of the stint, there are some good trees which although not measuring up to ancient are notable for their positions on the boundary. There are three Ash Trees and a good sized Willow. Due to the way the ditch meanders there is no hedgerow actually alongside but along the edge of the adjoining field. In Stint 21d we still have a good ditch and this is where the ancient layering of hawthorn is most evident as the ancient boundary. Both 21c and d are enclosed on one side by immature thicket especially dead elm. 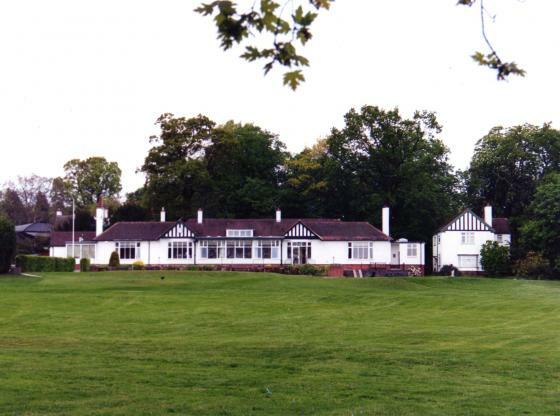 Owners: Rothley Park Golf Club, Westfield Lane, Rothley. with a girth of approx. 2.8m but not in good condition like many of the Ancient Boundary Ash Trees. I have already recorded this under Site 226 Pethefers Close Ash Tree 635. It is hollow inside with fungi so on borrowed time. There is some ancient layered Hawthorn as the boundary hedge but also modern hawthorn planting to fill the gaps. 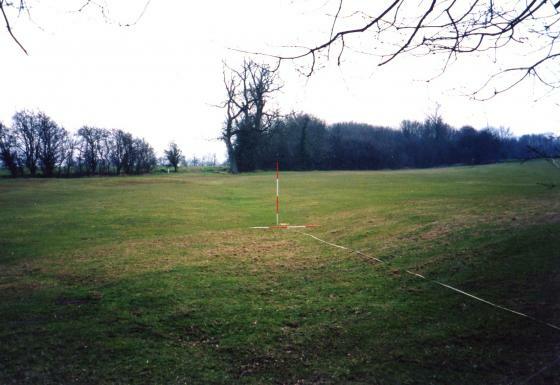 This takes us into Site 308 South Field Close, but at the time of the ancient boundary it would be over its hedgerow with West Hall Field now removed to make one large field. Stint 22d should take us over this lost field boundary and as there is no evidence left of its existence we will not be measuring or recording it except by a photograph and it will also be recorded as Stint 23. Stint 22d does not therefore exist. We have called this Stint 23 even though it leads on from Stint 22c. This is because it runs into a ploughed field before turning and heading for the golf course at Fairway 10. There is no evidence of a boundary and therefore nothing to record. 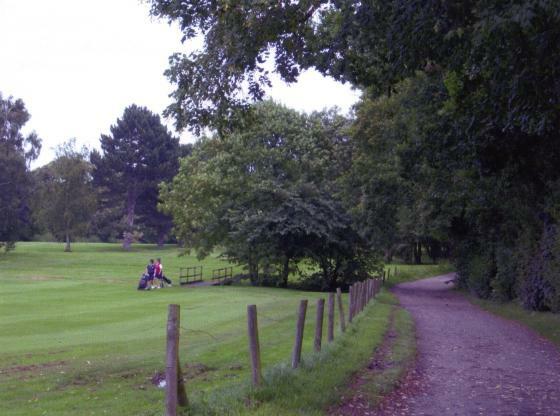 This is another piece of 'lost' ancient boundary which runs across Fairway 10, then over the Bridle Road into another part of the golf course. Again, there is nothing to record but there is an ancient Oak stump that could indicate where the boundary used to be. XHTML 1.0 validated. WCAG compliant. Page generated in 0.2373 seconds.